Today is one of the most important days of Hillary Clinton&apos;s political career, as the Democratic presidential candidate will face grilling for as much as eight hours potentially over the 2012 terror attack on the diplomatic outpost in Benghazi, Libya, that claimed the lives of four Americans, including U.S. Ambassador Chris Stevens. Questions about the attack and whether Clinton, as secretary of state, should have heeded warnings and provided more security for Americans there abroad have been fodder for GOP attacks for some time. But the House Select Committee on Benghazi has come under even more political scrutiny lately. Some Republicans — including House Majority Leader Kevin McCarthy — have said the committee succeeded in bringing down the Democratic presidential hopeful&apos;s poll numbers. Now, more than ever, Select Committee Chairman Trey Gowdy, R-S.C., will be under pressure to show the legitimacy of the committee&apos;s investigation and purpose. Whatever Clinton says, along with how she acts and responds, will be heavily parsed and be even more material for GOP attack ads. The committee consists of 12 members — seven Republicans and five Democrats. Following opening statements by Gowdy and Ranking Member Elijah Cummings, D-Md., Clinton will make her opening statements. Then, each member will get 10 minutes to ask questions, per round. But the testimony and questions could go several rounds, meaning that the proceedings may not wrap up until very late. NPR&apos;s Tamara Keith has a full preview here. We&apos;ll be liveblogging the day&apos;s proceedings until 6 p.m. ET. You can watch the hearings live here. 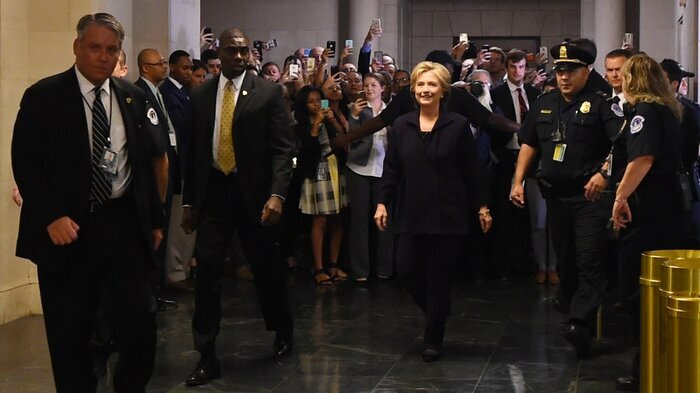 10 a.m. NPR&apos;s Tamara Keith, in the room for today&apos;s hearing, sends this video capturing the frenzy of this morning as Clinton arrives to testify. 10:15 a.m. Chairman Gowdy&apos;s opening statement is largely trying to legitimize the committee&apos;s efforts, which have been under fire and damaged by the GOP suggestions that the committee&apos;s purpose is political. Gowdy argues that even though many previous committees have investigated these attacks as well, theirs goes much deeper in scope and is far more comprehensive — largely because they have her emails from the State Department to peruse. Remember, this is how the scrutiny over Clinton&apos;s private server at State began. Still, Gowdy tells Clinton "let me assure you" this investigation is not about her. "This investigation is about four people who were killed representing our country on foreign soil. It is about what happened before, after and during the attacks that killed them. It is about what this country owes to risk their lives to serve it. And it is about the fundamental obligation for the government to tell the truth always to the people." As for her emails, which Gowdy calls "an unusual email arrangement," Gowdy again argues that "not a single member of this committee signed up to investigate you or your email." His closing: "We are going to find the truth because there is no statute of limitations on the truth." 10:30 a.m. As much as Gowdy&apos;s opening statement was about legitimizing the committee&apos;s efforts, Cummings&apos;s remarks are about de-legitimizing it. Very forcefully, the Democrat decries the committee&apos;s existence — "with no rules, no deadline, and an unlimited budget....set loose on Secretary Clinton because she is running for president." "Clearly, it is possible to conduct a serious, bipartisan investigation. What is impossible is for any reasonable person to continue denying that Republicans are squandering millions of taxpayer dollars on this abusive effort to derail Secretary Clinton&apos;s presidential campaign," said Cummings. He concludes that none of her emails or documents "show any nefarious activity. In fact, it&apos;s just the opposite. The new information we have obtained confirms and corroborates the core facts we already knew from the eight previous investigations. They provide more detail, but they do not change the basic conclusions." 10:45 a.m. The biggest difference between Clinton&apos;s opening statement and the fiery rhetoric and verbal barbs of Gowdy and Cummings — tone. Clinton begins her testimony very reserved and soft, striking a very reverent when talking about what happened and those who were killed. "I am here to honor the service of those four men...and the work their colleagues do every single day all over the world," she says. She defends the work that Stevens and other did in Libya, and the dangers that foreign service officers encounter every day: "America must lead in a dangerous world, and our diplomats must continue representing us in dangerous places....Retreat from the world is not an option. America cannot shrink from our responsibility to lead." She also pivots to other attacks that took American lives — most notably, on 9/11. "Part of America&apos;s strength is we learn, we adapt and we get stronger." She also notes that recommendations from the Accountability Review Boards are being implemented after Benghazi — but that those for more training facilities before going into the field are being held up by Congress. And a nod to her own White House hopes, perhaps: "We need leadership at home to match our leadership abroad....We should resist denigrating the patriotism or loyalty with whom we disagree. So I am here." 10:55 a.m. Rep. Peter Roskam, R-Ill., presses Clinton on whether the U.S.&apos;s Libya policy was driven by her. "Our Libya policy couldn&apos;t have happened without you, because you were its chief architect," he tells her. She turns it back to pointing out it is the White House, not her, that drove foreign policy. But the most notable, and most memorable, exchange between the two is when Roskam, twice, lectures her for looking at her notes. "I can pause while you&apos;re reading your notes," he tries to chastise her. Clinton&apos;s retort: "I can do to things at once." 11:05 a.m. Cummings again largely gives Clinton cover, asking her about the process for security and pointing to other partisan attacks on Clinton over Benghazi, like hearings led by former House Oversight Committee Chairman Darrell Issa, R-Calif. Cummings: "The problem is that Republicans keep asking the same question over and over again and pretend they don&apos;t know the answer." 11:15 a.m. NPR&apos;s Will Huntsberry, also in the room for the hearings, notes this exchange, about Ambassador Stevens: "Clinton says Chris Stevens volunteered for his mission and was anxious to undertake it. He was using 19th-century diplomatic techniques more than those of current day, she says. Before more sophisticated communication systems were available, Clinton says diplomats would often operate for months at a time without having communication with State Department. During uprising in Libya, internet and communications were spotty, she says. Stevens would meet with local leaders and make decisions on the ground about how much he could accomplish. His length of stay would be uncertain and based on his own assessment of capabilities on the ground. It was &apos;hard-nosed&apos; diplomacy, based on building relationships and gathering information, says Clinton. &apos;We all knew this was risky undertaking.&apos;"
11:25 a.m. Rep. Susan Brooks, R-Ind., focuses on Clinton&apos;s email habits at state, and brings a prop — showing the large number of emails Clinton sent about Libya and Benghazi after the attacks versus the much smaller pile she sent before. Clinton underscores again that she didn&apos;t receive classified material — or things that were then classified, some have been classified retroactively — on her email server. "Most of my work was not done on emails," she says, also noting that she "did not email during the day" except on rare occasions, because she was busy and didn&apos;t have a computer in her office. 11:30 a.m. The Benghazi hearing are also the hottest ticket in the Capitol it seems — with very limited space. NPR&apos;s Tamara Keith notes that members of Congress from both parties keep coming in to monitor the hearing. But there&apos;s not enough room for them at the reserved members table, so they are sitting in open seats in the public seating area. Issa, the former Oversight committee chairman, was just here, then bailed out — the seats in the room are pretty uncomfortable and cramped. 11:35 a.m. Rep. Tammy Duckworth, D-Ill., is the only military veteran to question Clinton so far — she lost both her legs in Iraq when a helicopter she was piloting was downed. She&apos;s also running for Senate this year in one of the top competitive races. Her questioning mainly focuses on the logistics of security and military forces on the ground. 11:45 a.m. Rep. Martha Roby&apos;s, R-Ala., line of questioning seemed primed to try to paint Clinton as disengaged, even seeming to suggest Clinton didn&apos;t know about the extent of the U.S. presence there. "Of course I knew we had a presence in Benghazi," she tells her. She defends the amount of security on the ground, saying it was Stevens&apos;s decision to go to Benghazi and that he had the requisite five members of security, but that "the kind of attack that took place would have been very hard to repel." 11:55 a.m. Rep. Adam Smith, D-Wash., again gives Clinton cover from Republican attacks, decrying the partisan nature of the committee, which he says has "an obsession" with her emails, per NPR&apos;s Amita Kelly. "Why have we spent the $4.7 million we&apos;ve spent? This committee is simply not doing its job," noting "we&apos;ve learned nothing we didn&apos;t know already." When he yields back his time, Chairman Gowdy takes a swing at him, saying he can refer him back to his opening statement detailing their findings. 12:10 p.m. Rep. Lynn Westmoreland, R-Ga., peppers Clinton with questions about Stevens&apos;s requests for more security. While he did not have her personal email, he did correspond with other members of her staff, she says. "Yes, he and the people working for him asked for more security. Some of those were approved, others were not. We&apos;re obviously looking to learn what more we could do, because it was not only about Bengahzi but it was about the embassy in Tripoli," Clinton says. 12:20 p.m. Rep. Mike Pompeo, R-Kan., continues a tough line of questioning about why more security wasn&apos;t provided per Stevens&apos;s request. He also focuses on why no one was held accountable for the intelligence failures. She says that in the review, no breach of duty was found in the review. He also focuses in on the role of "frequent emailer" Sidney Blumenthal — a longtime adviser to the Clintons. She says he was just passing along information, but Republicans are trying to make him the bogeyman of hearings and show Clinton was relying on political advisers, not foreign policy advisers. Rep. Linda Sanchez, D-Calif., picks up the questioning next and gives a lot of cover to Clinton, throwing her softball questions to let her "debunk myths" on the Blumenthal allegations, saying she received intelligence from many people, including Stevens himself. She also plays a clip of this past weekend&apos;s "Meet the Press" on NBC, when Pompeo repeated his allegations that Blumenthal was her primary source on Libya. Andrea Mitchell jumps in, telling him she covers the State Department day in and day out, and that is factually inaccurate. It&apos;s something the Washington Post&apos;s fact-checker (who&apos;s getting a lot of love from Democrats today) also debunked, giving it four Pinocchios. 12:45 p.m. Rep. Jim Jordan, R-Ohio, has perhaps the toughest line of questioning of Clinton so far — pressing her on why she and other administration officials at first insinuated the attack in Benghazi was spurred by an offensive video instead of being a terrorist attack. She answers that her mention of the video at first was trying to quell attacks in other places that were being influenced by the video. Clinton also pushes back that her moves were designed to help the president, with these attacks coming less than two months before the 2012 election. Bloomberg&apos;s Josh Rogin notes that this exchange gives us two new bits of information about the timeline over the video in the immediate aftermath — she had told the Egyptian Prime Minister the day after that the attacks had nothing to do with the video, but was a "planned attack," per her emails, and also that she had emailed her family that night, telling them that the attackers were from a group similar to al-Quaeda. 1 p.m. Rep. Adam Schiff, D-Calif., the final questioner in this first round, again attacks Republicans for making the committee a political one, saying the only reason Clinton is even here because a Stop Hillary PAC pressed for her to appear. His questioning of her gives her a chance to have perhaps her most memorable moment so far. When asked if the allegations are painful to her, Clinton becomes very quiet and thoughtful. "I would imagine I&apos;ve thought more about what happened than all of you put together," she tells the committee. "I&apos;ve lost more sleep than all of you put together. I&apos;ve been racking my brain about what more could have been done or should have been done." 1:05 p.m. Rounding out the first round, Chairman Benghazi snips back at Schiff&apos;s allegations that Republicans are prosecuting her. He underscores there are many more witnesses to hear and no one has reached any conclusions again. He also brings back up Blumenthal, trying to show how influential he was to Clinton given his many emails, and also noting that he worked for liberal groups like Media Matters and Correct the Record, a group supporting Clinton. She says many of the emails were unsolicited, and she passed along some of those emails, and others she did not. 1:15 p.m. The biggest fireworks of the day so far aren&apos;t between Clinton and any committee member — Gowdy vs. Cummings that got very heated, very quickly. The two are arguing again over Blumenthal — Cummings is insisting that his testimony before the committee be released and says, per a parliamentary maneuver, he can move for it to be done right now; Gowdy disagrees. It&apos;s clear that Blumenthal has become the biggest flashpoint — and before Gowdy abruptly breaks he says there will be much more about him during the next round. They weren&apos;t even questioning Clinton at the end — and per people in the room on social media, Clinton looked perfectly gleeful that the whole affair had devolved into screaming and mudslinging. And with that, we&apos;re on a lunch break. We&apos;ll return with the next round of questioning soon. 2:15 p.m. Testimony is about to resume, but during the break NPR&apos;s Will Huntsberry sends over this tidbit: "When the hearing took its first break, Clinton shook hands with some congressmen and well-wishers among the crowd. Speaking to one person she said, &apos;I tried to meditate during the breaks,&apos; presumably referring to long stretches where committee members were talking." 2:21 p.m. Round 2 is off. First act: They vote on whether to release the transcripts of Sidney Blumenthal&apos;s testimony — what the tiff between Gowdy and Cummings was just before the break. It&apos;s shot down along party lines, 7-5, but not before a near miss. Westmoreland, R-Ga., at first votes yes before Gowdy nudges him that it&apos;s supposed to be a no vote. 2:35 p.m. Gowdy opens the second round by, as promised, peppering Clinton with more questions about her emails from Sidney Blumenthal. His, and other GOP, objections, boil down to this — Blumenthal could reach Clinton on her personal email while Ambassador Stevens could not. Gowdy characterizes his correspondence as "meaningless political advice" and "insults of people you worked with." Clinton again underscores that he was not an adviser. Stevens&apos; security concerns were channeled through the appropriate people, she says. During questioning later from Democratic Rep. Sanchez, she notes that Stevens never asked her for her personal email — but if he had, she would have given it to him. 2:40 p.m. Former Ambassador to Russia Michael McFaul tweets this, seemingly bolstering Clinton&apos;s claims. Democratic Rep. Smith brings it up later in his testimony. 3:05 p.m. Republican Rep. Brooks points out that the committee still doesn&apos;t have a full picture of Stevens via his emails, because they only have copies of hers and ones of his forwarded to her. Democratic Rep. Smith turns back to the Democratic chorus: this is a partisan prosecution, seemingly apologizing to her for it, saying there will be plenty of time to do that in the coming presidential campaign. "Right now this committee is not doing a service to the four people who died or their families." 3:15 p.m. Clinton is now describing, in pretty stark detail, about the night of Sept. 11, 2012, and how Stevens and diplomat Sean Smith died. Despite retreating to a safe room in the nearby CIA annex, they still were not safe from the attack because they eventually died from smoke inhalation. "This was the fog of war," Clinton says. 3:25 p.m. GOP Rep. Pompeo back to questioning, trying to establish the close relationship Clinton had with Blumenthal as compared to Stevens. "Did he have your cell number? Your home address? Your fax?" he asks her. The answer to all, no. 3:35 p.m. A good point from CNN&apos;s Manu Raju on Democratic Rep. Duckworth&apos;s questions so far — Democrats are making partisan jabs at every turn, but she has focused on facts and asked specifics. She&apos;s also the only one who is running in a tough Senate race next year. 3:50 p.m. Just before a break for votes, much of GOP Rep. Roskam&apos;s questions focused on an April 2012 memo that her top aide Jake Sullivan had drafted — before the Benghazi tragedy — calling Clinton "the public face of the U.S. effort in Libya" and points to the appointment of Stevens along with her role in removing dictator Moammar Gadhafi. Roskam accuses her of trying to milk the situation for political gain and to get favorable press — which is pretty much what every politician&apos;s press office does, and memos like this are routine. She says it was drafted to aid an article a reporter was writing. But Roskam says it&apos;s the personification of what he calls the Clinton Doctrine: Seizing an opportunity "to turn progress in Libya into a political win for Hillary, and at the precise moment things look good to take a victory lap." The committee has now taken a brief recess for House votes, and is expected to return around 4:30 p.m. We&apos;ll be back then. 5:15 p.m. Votes took a bit longer than expected and didn&apos;t resume until just after 5 p.m. From there, GOP Rep. Roby picked back up the questioning, asking Clinton about $20 million designated for Libyan security, and why that wasn&apos;t used to provide more diplomatic security, if Stevens and others had indicated it was needed. Clinton said they asked Congress for additional money but that request was not fulfilled; Congress, she says, has since provided more. 5:25 p.m. Ranking member Cummings is next, and he again uses his time to hammer home that the committee is political and unnecessary. He shows a clip to his old nemesis, former Oversight Committee Chairman Darrell Issa. Also, Clinton is talking again about a controversial anti-Muslim video that, at first report, seemed to be the cause for the protests in Benghazi. Asked why she didn&apos;t correct it elsewhere, she underscores that the video was still spurring protests in other places and still provided a security threat and needed to be disproved. 5:35 p.m. GOP Rep. Westmoreland asks, as to Clinton&apos;s earlier statement that she&apos;s been kept up at night as to what she could have done differently to prevent the Benghazi attacks. Her answer: militia engaged by CIA & State Dept. could have been more reliable. 5:45 p.m. Republicans voted down earlier allowing the testimony of the much-discussed Sidney Blumenthal into the public record, but Democratic Rep. Schiff tries to find a way around that by characterizing the types of questions the committee asked him. Per his recounting: Republicans asked him 50 questions about the Clinton foundation, but only four about security in Benghazi; there were 270 questions about his business interests in Libya; and 40 questions about Media Matters/Clinton ally David Brock but none about Ambassador Stevens and other U.S. personnel in Libya. With the time spent on Blumenthal, Schiff says, "you&apos;d think he was in Benghazi, manning the barricades."